Opening Remarks: So the one guy that left the game and didn’t come back was Tae Davis with an ankle sprain. We had a couple other guys that were in and out, and if you’re interested in that along the way here, I can talk about it. Again, Tae will most likely be available this week, but we’ll have to see. Other than that, it was a good team win, took us a little longer to win than we liked. The message after the game: toughness and resiliency in a sport where that’s demanded, we were able to display that yesterday. We didn’t do enough things well enough throughout the game and there’s plenty mistakes that need to be cleaned up, and we’re getting that done today. But in the last month, we’ve won three games, and we’re just fighting forward, looking forward to the opportunity to go down and play a division game against the Redskins this week. I’ll try to answer your questions. Q: Is Sterling (Shepard)’s status up in the air this week (ribs)? A: By all accounts, he’ll be there, so we’ll see. Q: How is Saquon (Barkley) feeling today? A: Fine. He had a little pad adjustment, so he’s fine. Q: How do you feel when you see him hurdle a guy? Is there any part of you that doesn’t want him to do that or is it part of his repertoire? A: No, if he can advance the ball, I think that’s a good thing. He really runs under control, he’s got outstanding body control and the fact that he can do that, I think, is amazing. But no, you certainly don’t want a player to do anything reckless and get himself hurt. Q: You looked like you sat Curtis Riley for a couple series or he was banged up, and Sean Chandler was in there, Michael Thomas was in there. Is that a position that’s in flux? A: We’re trying to rotate a little bit there just to make sure we’ve got the right people on the field at the right time. Then you saw (Curtis) go back in when Landon (Collins) was in and out. I think it’s important, the way our roster is right now on the backend, I think it’s good for us to get all those guys in the game. Q: What was your assessment of the onside kick when you went back and saw it on film? It was said there may have been a missed block, and do you think Odell did everything he could? A: Yeah, I think we just didn’t execute that very well. We would have liked to have seen better blocking in the front line, which would have created more separation for the back line. I think maybe Odell sort of misjudged the pace of the kick, which kind of put him a little bit behind it, and then he tried to do, based on what I saw, what you would do to the kick if it was closer to the sideline, bat it out of bounds. In my mind, we just executed that play poorly. On the flip side, Chris Tabor, their special teams coach, was my special teams coach in Cleveland, so we worked together. I know he’s a very good special teams coach and they executed that play well. They executed well and we didn’t, that’s really the gist of it. Q: With this offensive line, are you now going into games thinking more progressively than trying to be defensive with that group? A: No, I think as you start to play behind an offensive line, you have more confidence just as the play caller, there’s certain things you can maybe get to a little quicker. Keep in mind, I think that was as good a front as you’re going to ever play. I think they’re an outstanding group. We had two sacks before the half in just pure drop-back situations, which there’s always contributing factors in sacks. We missed on a twist and then the second one, and then we were just trying to set up the heroic run for Saquon, that’s what we were really trying to do there. We were trying to back it up so he had further to go. No, I think they’re playing better, I really do. They accept the challenge each week to protect for the passer and then also help the runner have room to run, and I think they’re playing better together. I think a lot of it is because they’ve played together longer, like you said. Q: You’re very in tune with offensive lines for a lot of reasons. What identity do they have? What kind of group do you think they are? A: I don’t know, somebody asked me the question last week about what I want the identity of our team to be or our offense (to be). I think they need to be physical, number one. They’ve got to be smart, and then they’ve just got to do their jobs. It’s certainly important to block your guy. Most often, offensive linemen are playing against guys that are better than them physically. There’s times you draft a defensive lineman and move him to offense, you don’t see many guys playing offense that get moved to defense. That’s why the coordination of combination blocks and getting to the next level and doing what we can to work together, in most scenarios, it’s five guys trying to get four guys blocked initially, so that’s where the coordination comes in. First off, you’ve got to be able to block your own guy, but then the coordination of working together. Q: You moved Kyle Lauletta up to the number-two spot yesterday. Was that any indication he’s closer to being ready to go into a game and be comfortable playing? A: Yeah, I think that’s a fair evaluation of that. Behind the scenes, we’re watching. We evaluate every step every player takes, everything they do all the time, and I’ve said all along he had a long way to go. He came from a small program, he did enough things in the preseason to say he’s good enough to make our team, but we needed to see more from him in order to feel confident in giving him a jersey, and he’s done some things behind the scenes that have given us more of that confidence. Q: When you say he has ‘made progress’, what does that mean? What can a QB do behind the scenes or on the practice field when he’s working with the scout team to get to that next level? A: Practice field, working with the scout team, how he prepares, what he looks at in his preparation, the interaction we have with him. ‘Hey, it’s third-and-five, what play do you like?’ Just the interaction you have with a quarterback, it’s pretty in-depth, and we’re fortunate to have a terrific quarterback room here, so just the things that we see as coaches. That’s really what it is. Q: Does anything change now with your quarterbacks in practice in terms of who is taking scout teams reps, second-team reps? A: No, and again, because you don’t get to see it and I don’t know how much you’ve ever seen, the starter gets the reps and the two guys that are backups take the scout team reps. Then the individual work and the drill work and all the things necessary to get yourself ready to go, that’s part of, in my opinion, what makes a good backup – being able to go in and execute with very few reps. That’s where experience plays in, that’s why (Alex) Tanney was ahead of Lauletta, in my mind. We’re in a situation now where we feel comfortable with both of them doing it. That’s really it, because you can’t get two quarterbacks ready. You only run 50 or 60 team plays a day, you don’t have enough time to get two guys ready to play. That’s why you have a starter and that’s why you have backups. Q: Can you shed any more light on the timing of the decision? A week ago it seemed like you said Tanney was ahead of Lauletta. Why this week to make the change? A: Because I thought it was time, that’s why. That’s the timing of it. We don’t always tell you everything we’re thinking. If you ask me a question, I’ll tell you. Nobody asked me how close he was to Tanney. Q: You seemed to feel a week ago that Tanney didn’t deserve to be jumped over, he deserved a shot. A: I didn’t say that. I said don’t dismiss the fact that Tanney could go in and do it. I didn’t give you an order, I didn’t give you the distance between the two. That’s what I said. Q: Is there an internal plan to get Kyle game reps to evaluate him? A: We’re trying to win every game we play. You can look at this a lot of different ways, there’s a lot of models to developing a quarterback. A year ago in Kansas City, the only game (Patrick) Mahomes played was the last game of the year that had nothing to do with their playoff status. But they had seen enough to say we’re going to do this with this quarterback, and do this with this quarterback. The models are all different when you develop quarterbacks. We have a starting quarterback that we believe in. We put him out there because we believe he’s going to lead us to victories, and then behind the scenes, much like every other position, we’re developing those players. It’s just like you guys are experts at your job, deciding what the story line is, writing a story and doing your thing – this is our job, this is our profession, this is what we do, we try to develop young men. We do it behind the scenes. Q: What can a quarterback gain by being active even if he’s not playing? Is there any benefit for Kyle? A: I don’t think so. Tanney was on the sidelines just as in tune as if he had a uniform on. In my mind, the only thing is you’re one ankle injury from being in there. If they both don’t train to be ready to play, then they’re selling themselves and this organization short, and based on what I’ve seen and based on the way they train, both guys each week get themselves ready to play. Q: You talked about how Tanney was one level, Lauletta was another level, and now you feel comfortable moving Lauletta up. That’s two and three. 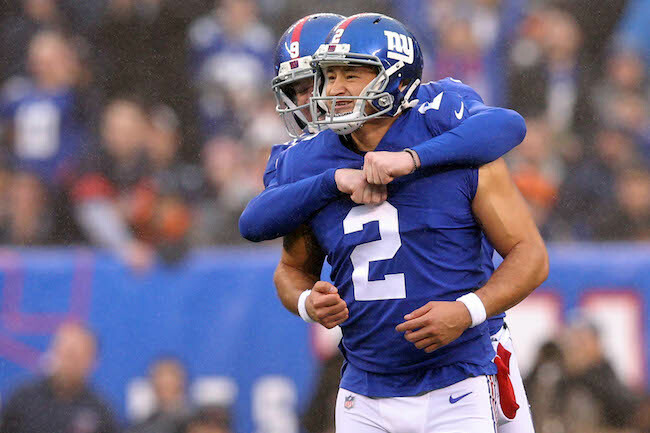 Two and one – is there a huge gap between Lauletta and Eli now still? A: I don’t know that, and you’ll only know that if and when Lauletta gets in the game. I think that’s where you see that. In my mind, Tanney and Lauletta are both valid choices as backups now. You guys can stack them how you want. Q: Are you open to playing Lauletta before this season is over if you think he gives you the best chance to win? A: If he’s active to play and for whatever reason the way the game is going, for whatever reason I feel like he gives us a better chance to win, then he’ll go in. But that’s the case for all positions. A: Eli is our starter. Q: Eli will start the rest of the year? A: Eli is going to start this week against the Redskins. I don’t want to get into a play on words here. Eli’s our starter, and we have two backups. Last week, Lauletta dressed as number two. Q: Are you open to having Lauletta start at some point this season? A: I want to win every game we play, starting with the Redskins. That will be with Eli as our starter. Q: If Kyle doesn’t play in a game? A: Yeah, then he’ll stand there and watch. Q: You weren’t here last year, there was a young quarterback who didn’t get in a game, so then all you’re evaluating is practice tape. Now you’ve had the chance to work with Kyle every day. Can you determine without him playing in games whether or not he’s the answer? A: That’s a decision for down the road. We’re determining what they can do all the time. Q: You’ve mentioned you’re having young players develop everywhere, but you’re seeing Sean Chandler play, Tae Davis play, all these other guys play. A: Way different than the quarterback position. Q: You expect Kyle to be the number two this week? A: There’s a good chance he’ll be the number two this week. Then we’ll visit next week and we’ll talk again. Good chance. Q: Obviously you’re focused on the Redskins, but is there no discussion as a coaching staff or you with Dave (Gettleman) about down the line? You’re not making any plans for the last three games after this one? A: Nope, we’re trying to win this game. We’re trying to get 8-8 one game at a time and then see what happens from there. We have all types of discussions behind the scenes, it’s very fluid. Dave and I talk throughout the week, I have conversations with John (Mara), Steve (Tisch), we’re always talking about this team, evaluating or really talking about who played well, who needs to play better as we move forward, this and that. There’s always conversation about what happened, where we’re going, short and long term plans, but again I would never share that with anybody. But don’t be surprised by the answer because that’s something that we all do all the time regardless of your role. As head coach, I’m obviously involved in all of those. When I was a coordinator, I was only involved with the offensive part of it. Those conversations are happening all the time. Q: So it’s fair to say that the hypotheticals we’re bringing to you, you may already be having those hypothetical questions behind the scenes but you’re just not ready to present those answers? A: And I may never present those answers. There’s billion-dollar businesses that have issues of the day they don’t share with the world and I don’t think our business is any different. Q: Mathematically, the likelihood of making the playoffs, you’re not eliminated from anything. A: That’s right. It’s amazing for some of you to probably come to grips with, but we’re not. Q: Right, at the moment. But at some point, is that part of the discussion in your mind that if that happens, then maybe we shift gears? A: Maybe we will at that time, but if we do, then that’s a question and an answer for a different time. I think that’s fair. Are you all good with that? Q: The guys that missed last week, any chance they’re coming back (this week)? A: The two that I’m looking at right here, Evan Engram and Lorenzo Carter, we’ll have to see. We’re hopeful, but we’ll see. Q: You have a decision to make on (Jonathan) Stewart. Have you made that decision yet? A: We haven’t. I think we have until Thursday, so we’ll have to make that decision by Thursday. We all know what that means, right? We either have to make a decision and put him on the active roster or he’ll be down for the year. We have a couple of days and we’ll have a couple conversations as we go. Q: What would bringing him back add to a room with Saquon and Wayne Gallman? A: We appreciate everything he’s done. He’s been around, he’s been in the room, so his presence has been felt all year. That’s partly why he was here. Everybody in the building thinks the world of who Jonathan is as a person and a player, and all along he’s had a good impact on our young rookie running back who has been asked to carry the load. We appreciate that about him. This really on Thursday just becomes a business decision and we’ll just have to see how it fits roster-wise. Q: Three-quarters of the way through his rookie season, what’s your evaluation of Saquon and how the season has gone for him? A: I think he’s had a positive impact on our team. I said it early and I really believe it, he’s got a generational spirit in terms of how he competes and I have not been, WE have not been disappointed in (any) way. He’s extremely talented running the ball, catching the ball, he blocks well, we’re doing what we can to give him the football so he has an impact on the game, and I think he has. Last week someone was talking about how he has great production and the answer he gave was, I’m just trying to continue to work on the little things, just keep being you. If that’s your mindset, then we’ll try to encourage that along the way because great players that have that mindset and are worried about getting a little bit better, then I think that’s good for us. A: They did a good job of working their way down the field, but we had some guys like OV (Olivier Vernon) had his best game by far and I thought he had an impact on the game. B.J. Hill got sacks and was disruptive. I thought Jackrabbit (Janoris Jenkins) competed throughout, and then Tree (Alec Ogletree) had the two interceptions. He’s going to want to move to tight end now. Couple guys on defense make catches and now they want to play offense, which is good. We had some guys, we did some things in the game that were really, really good throughout the game. The game got tied at one point, but at the end of the game when we needed to get a stop, we did. But there were things within the game that were really good, and I think I would be remiss if I didn’t mention the fact that those guys had positive a contribution. Q: Janoris has really flipped his season on its head here. What has he done differently the last few weeks? A: He just competes and keeps the noise out, that’s it. He’s a tough sucker and I appreciate his spirit, too, because he just keeps competing. Every once in a while people get beat, but he just keeps fighting, competing. He tackled me once. I just like the way he competes, and you’re all becoming well aware I’m fond of the competitive guys and he’s a competitor. I was glad that he was able to be the focal point of that last throw and he was able to disrupt it the way he did. That’s good.